Burritos are a really quick midweek meal. I fry the filling in a cast iron pan which retains the heat evenly so you can cook your veg quickly without burning and while retaining their juiciness. You can use peppers, tempeh, other green veg like Pak Choy…just about anything will work. I used oyster mushrooms but any kind will work. The fresh, corn salsa is my favourite part of this meal. I also love pineapple salsa. Heat the oil in a caste iron pan until it is hot. Add the onions and tofu with the garlic and spices. Stir continuously for a few minutes until onion are cooked but not soft. Add mushrooms and spinach. Stir for another two minutes and season. Meanwhile place all salsa ingredients into a food processor and blitz until smooth. Season to taste. Heat 4 tortillas. When warm fill with the burrito filling, fold and top with the salsa. Laksa is a spicy, coconutty, noodle soup. We travelled in Malaysia shortly after becoming vegan. Laksa was the best of Malaysian food and we were lucky to find a tiny vegan café in Malacca where they sold it in huge steaming bowls for less than a euro. It was some of the best vegan food we had eaten. Like many Asian soups, the secret is in the garnish which introduces bags of freshness to compliment the rich spiciness of the broth. 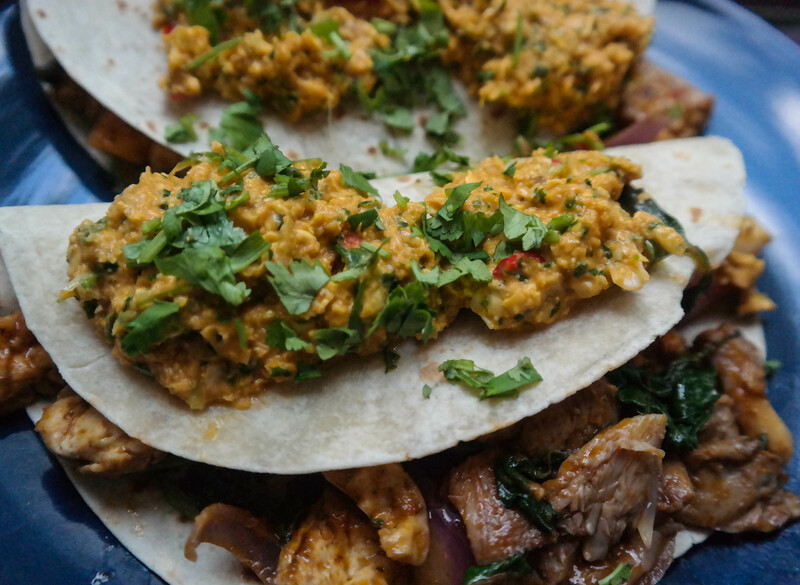 If you have pre-made curry paste as I did or you use shop bought, this takes only minutes to prepare. It is very messy to eat and you need a fork or chopsticks for the noodles and a spoon for the broth. Asian people are very adept at doing this without making a mess. I, on the other hand, usually end up wearing the noodles but it is fun to eat. 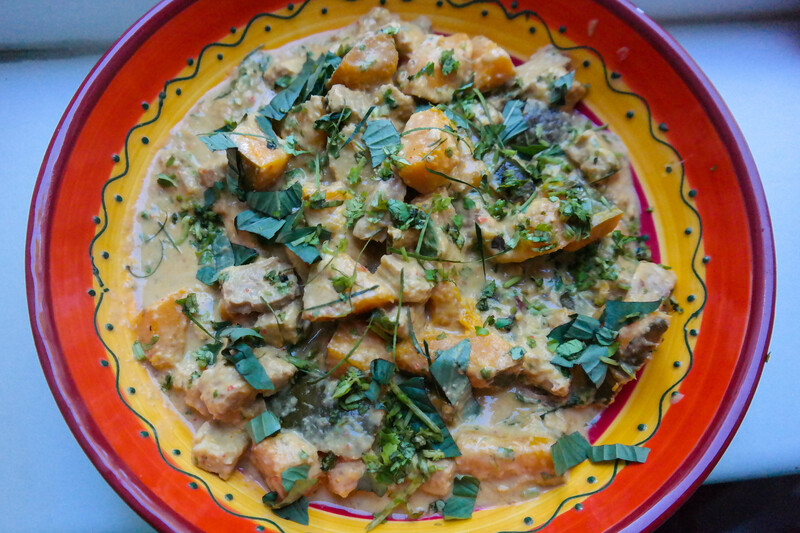 A tablespoon of homemade Malaysian or Thai curry paste or shop bought curry or laksa paste (see the recipe for Tempeh Penang for a good curry paste that would work well in this dish). Place the water in a large pan and bring to the boil. Add the curry paste with the coconut milk, soya sauce, sugar, lemon grass and ginger/galangal. Simmer for a few minutes before adding the noodles. Cook until the noodles are al dente. Add the spinach, tofu and half of the coriander, onions and beansprouts. 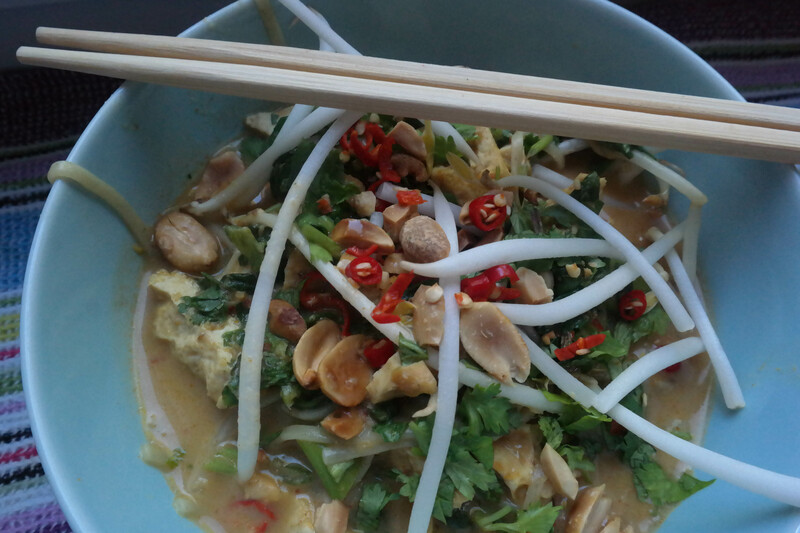 Ladle into large bowls and garnish with more coriander, beansprouts, onions, peanuts and chilli. I have been to Morocco and they definitely don’t have vegan burgers. However, I used Moroccan spices to flavour these burgers which are spicy and rich and can be served with just about anything. Try couscous or quinoa salad, potato wedges or just a huge green salad. When I make burgers, I don’t start off with a recipe as it really depends on what is in the cupboards and fridge. Any pulses and/or nuts and/or tofu will work. There are infinite flavours you can create by adding vegetables and herbs and spices. The problem with vegan burgers is getting them to stay together as you cannot use eggs to bind them. I discovered recently that a tablespoon of ground flaxseeds mixed go a paste with water and then added to the burger mix binds them really well. At last my burgers look like burgers. Blitz all of the ingredients in a food processor, except for the flaxseed paste and breadcrumbs. Turn out into a bowl and mix together. Add the breadcrumbs and the flaxseed paste. Form into burger shapes and put into the fridge for at least 30 minutes. Place on an oiled baking tray and cook in the oven at 180 degrees centigrade for 15 minutes before turning and cooking for 15 minutes on the other side. I found fresh tempeh in the Asian supermarket yesterday for just over a euro. Tempeh is fermented soya bean curd and they use it a lot in Indonesian cooking. It makes a nice change from tofu as it has more texture and really crisps up when fried. It also takes on the flavour of the sauce it is cooked in really well. This curry is influenced by Thailand, Burma and Indonesia. It is made with a homemade paste but you could buy a Thai yellow curry paste and add some fresh spices in the cooking to liven it up. Bought curry paste is very salty and needs sugar to be added to the curry to get the right flavour. The finished dish should be thick with the sauce coating the tempeh and pumpkin. It is quite rich so I made a Thai inspired salad to go with it. Make a paste with the first set of ingredients. I do this by first using the food processor and then transferring it to a coffee grinder to get it smoother. Add a few drops of water to get it moving. 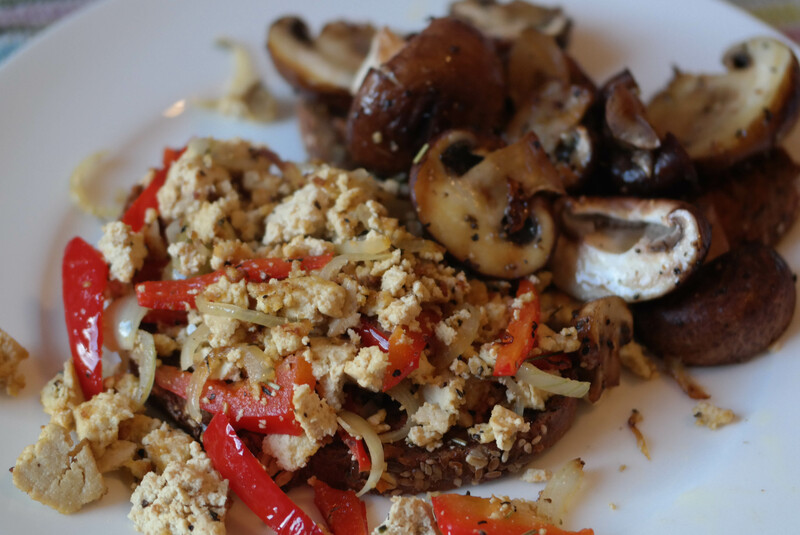 Cut the tempeh into small cubes or slices and fry in a tablespoon of oil on a low heat for about ten minutes, turning it until it is brown on all sides. Remove from the pan. Fry about half of the curry paste for a few seconds and then add all of the coconut milk and the pumpkin. stir through before adding back the tempeh. Add the galangal, cardamom and star anise. Simmer with a lid on for about 20 minutes until the pumpkin is just soft. Add salt to taste and then stir through the ground peanuts. You may need to let it down with a little water at this point if it is too thick. Stir through some finely chopped coriander and, if you can get it, Thai basil leaves and very finely shredded kaffir lime leaves. I served this with red rice.